Published on 17. 06. 2014 in commentary and criticism, hype & linkage and pictorial arts. Closed Tags: Marburger Jahrbuch für Kunstgeschichte, Titian, Venus and Adonis. Giulio Sanuto after Titian, ‘Venus and Adonis’, 1559, engraving, 538 x 415 mm. Copenhagen, Statens Museum for Kunst. 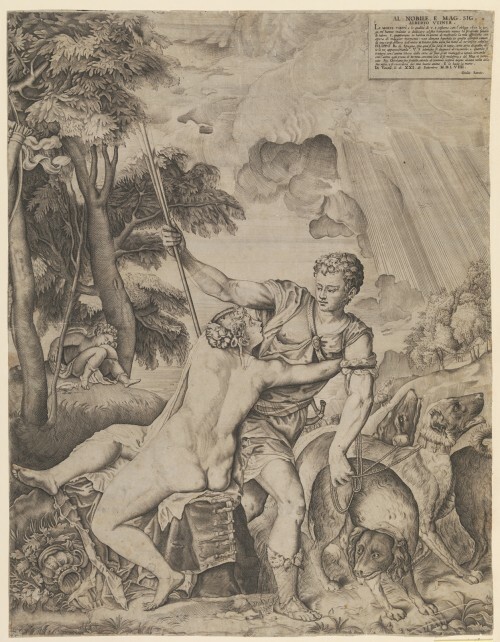 In the latest volume of the Marburger Jahrbuch für Kunstwissenschaft the interested reader will find my article on the permutations of Titian’s famous Venus and Adonis composition in sixteenth-century prints, and through them in painting. It turns out that careful examination of the sources and the prints yields fascinating information on how the master developed this, one of his most enduring compositions through multiple versions during the course of a long career. Titian’s Venus and Adonis was one of Titian’s most successful compositions and remains among his most iconic. Around a dozen painted versions are known today, the most famous being the canvas painted for Philip II around 1552–54 (Prado). Less well-known are the seven prints made of the composition in the latter half of the sixteenth-century. This article demonstrates that at least two of these were made with Titian’s approval and that they provide valuable insight not only into his work with printmakers, but also his production of replicas, reflecting as they do intermediate stages in his development of the composition through the 1550s.